1994. 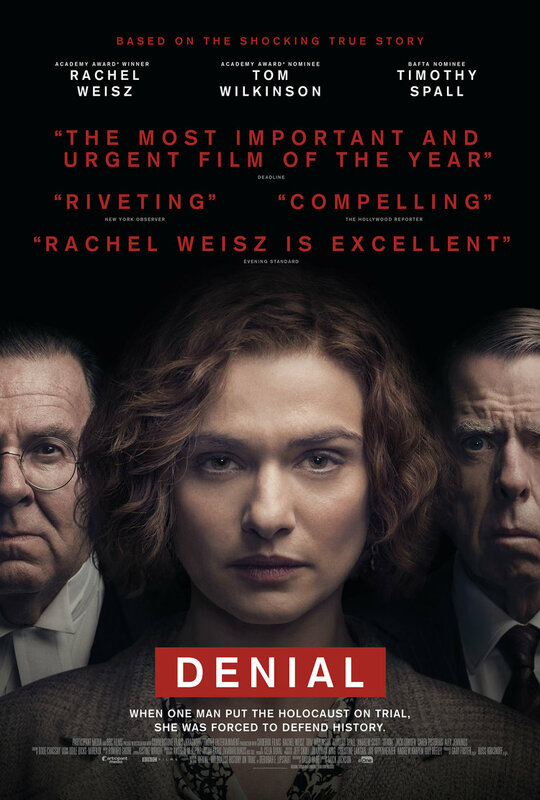 American Professor Deborah Lipstadt (Rachel Weisz) is speaking to an audience in Atlanta about her newly published book, DENYING THE HOLOCAUST: THE GROWING ASSULT ON THE TRUTH AND MEMORY. She’s articulate and impassioned and reasserts that she will never debate with anyone who says the Holocaust didn’t take place. What happens next is completely unexpected. Rising from the back of the auditorium is David Irving (Timothy Spall), a prominent figure referenced as a ‘denier’ in her book. Charismatic Irving challenges her criticism of him and expounds that there isn’t a single document in existence that proves that Hitler ordered the killing of Jews. Two years later Deborah receives word that Irving is suing her in a British court for defamation – even though her book has sold just 21 copies in the UK. She has no other option but to defend herself. Under British law she must prove the truth of her statements and, by default, prove that the Holocaust actually happened. She is matched with a brilliantly strategic but eccentric barrister, Richard Rampton (Tom Wilkinson) and Anthony Julius, an exceptionally smart legal mind best known as Princess Diana’s divorce lawyer. Irving, in true fashion, decides to represent himself. Rampton and his legal team ask Deborah to buy into a unique strategy – remain silent and not take the stand in her own defense and never allow a single holocaust survivor to be questioned by Irving. Remembering what her mother told her about her birth name (Devorah meaning ‘defender of her people’), Deborah has no choice but to put her faith in Rampton and Julius and join them in a defense strategy that forces her into silence and puts history itself on the stand.